Relevant customer insight is based on both contextual information as well as a loyalty database – allowing for better, more personalized interactions. The app provides right-at-the-moment-of-incident, personalized next best actions. These are derived from the Reservation, Departure Control System or Flight System to service passengers during irregular operations or unplanned situations. The app’s simple and intuitive user interface provides instant visibility of alternate flight options to help disrupted passengers select the best option and confirm reservations effectively. Location Services and Apple Maps enable agents to identify locations and detailed surroundings on the map to better assist passengers with directions. 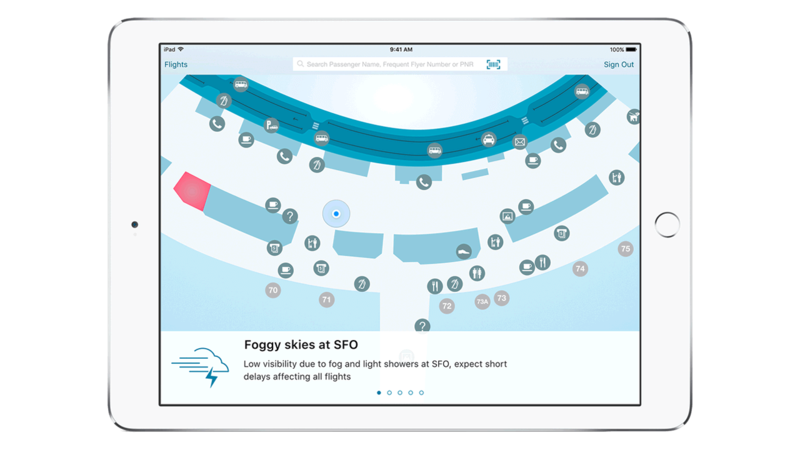 Push Notifications provide agents with real-time status of various airports and flights. Agents can provide timely information to passengers and make decisions in real time to resolve passenger issues quickly. Passports, driver licenses and credit cards can be easily scanned for a simple passenger information retrieval and check-in process using built-in camera. All this helps to reduce boarding and deplaning times and wait times for the passengers. Agents can also promote ancillary products to enhance the passenger experience and increase revenue for the airline.